Uzbek cuisine is a kind of branch of applied art and, perhaps, the rich cuisine ofCentral Asia. Its main distinctive and the most piquant feature is the intensive use of the meat. You know that only inUzbekistanyou can taste such wonderful dishes like pilaf, shurpa, lagman, damlyama and of course samsa – one of the honorable dishes of the Uzbek people. 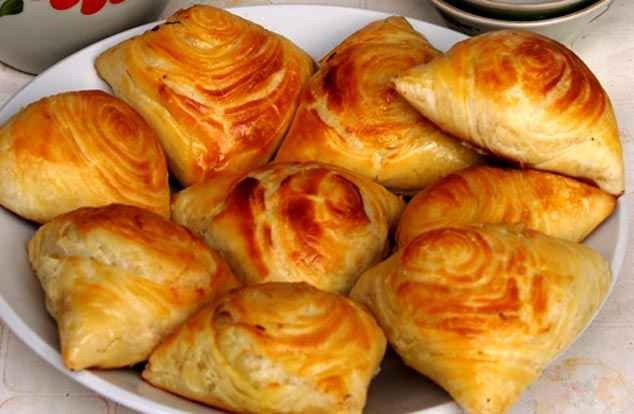 Uzbek Samsa is pastry dough with different types of filling (meat filling – lamb, beef, chicken, vegetable filling – pumpkin, potatoes, onion). Bu the main flavor that gives the dish such a delicious taste is spices – zira, black and red pepper, sesame seed, which is known as necessary component in the Uzbek cuisine. It is important to know the right proportions of dough and filling for preparing samsa. There are many recipes of its cooking. Usually samsa is cooked from flour, water, salt, meat or vegetable fillings. However, the most uzbek samsa, made of puff pastry. Earlier samsa was cooked only in tandyr, now in order to save time and convenience samsa is cooked in oven. Tandyr samsa, prepared outdoors, has an unforgettable taste and delicious aroma. Its delicate flavor, crispy crust, delicious filling will like both aficionado of meat dishes and beginning gourmet. Would you like to taste the real Uzbek samsa? Welcome toUzbekistan, where the aroma of this delicious dish is dissolved in a fabulous atmosphere of the East.